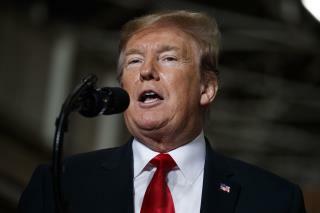 (Newser) – President Trump on Wednesday expressed confusion with why special counsel Robert Mueller is even writing a report ("It's interesting that a man gets appointed by a deputy, he writes a report, uh, you know, never figured that one out. Man gets appointed by a deputy, he writes a report," he said, later asking reporters to "explain" why "because my voters don't get it and I don't get it") but, nonetheless, he's apparently fine with said report being released to the public. "At the same time, let it come out, let people see it," he told reporters on the south lawn of the White House as he prepared to leave for Ohio to speak at a tank plant. "That's up to the attorney general. We have a very good attorney general, he's a highly respected man. And we'll see what happens. But it's sort of interesting that a man out of the blue just writes a report." Trump deliberately chose an AG who would suppress the report. He doesn't want it released and is confident it won't be. So why is he saying the opposite? The House of Representatives voted unanimously that the Mueller Report should be released. This was a huge slap in the face to Trump. By saying he wanted them to vote for its release, he's lying to save face. Of course he wants it released, but you know, it's not actually his decision to release it. He wants to release his tax records as well, but, unfortunately, he can't.